If you know something about command line,you may know what the figures from 1 to 5 describe.Yes,they are the whole conversion process to set the bit depth when converting html to bmp image.If you are a beginner of command line,this article will be a good teacher for you to understand the command line better. First,this article will introduce the software used in the conversion of html to bmp to you.You may never heard about HTML Converter Command Line before,which doesn’t matter.HTML Converter Command Line is a very powerful HTML conversion product. It allows you to create previews or thumbnails of web pages in a number of different formats, such as TIF, TIFF, JPG, JPEG, GIF, PNG, BMP, PCX, TGA, JP2 (JPEG2000), PNM, etc. 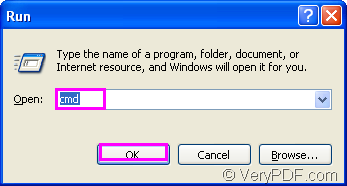 It also allows you to convert web pages to PDF, PS (postscript), WMF, EMF vector formats.The most important,HTML Converter Command Line is cheap in price,fast in running speed and easy in mastering.You can download HTML Converter Command Line at http://www.verypdf.com/htmltools/htmltools.zip and it will be a good helper in your work. You will see how to set the bit depth when converting html to bmp with HTML Converter Command Line from now on. 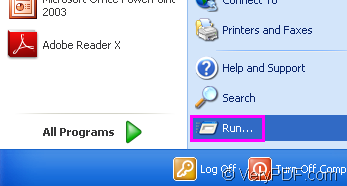 Please see Figure1.You should click “start” at the left bottom of your desktop and click “run” in the menu.You will see a dialog box pop up like Figure2 and please input “cmd” in “open” edit box.Then end with “OK” button.In cmd.exe dialog box,you should register the software HTML Converter Command Line by changing the current directory to installation directory with DOS command “cd” and input the register code,please see Figure3.Then you will use HTML Converter Command Line without any limitations. If you don’t want to run the conversion under the current directory,you can still use “cd” to change the directory to any location you want,such as C disk root directory in Figure4.Just input the command line which contains called program,parameter,source file and target file to convert html to bmp format and set the bit depth for bmp file. The command line must comply with the template showed above.Please see Figure4. 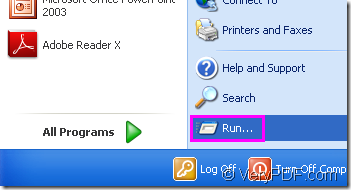 "C:\Documents and Settings\admin\Local Settings\Temp\htmltools\htmltools.exe" -bitcount 8 www.verypdf.com "C:\Documents and Settings\admin\Desktop\New Folder\verypdf.bmp"
"C:\Documents and Settings\admin\Local Settings\Temp\htmltools\htmltools.exe" is the path of htmltools.exe.The file can be dragged into cmd.exe dialog box directly. -bitcount 8 is the value to set the bit depth. www.verypdf.com is the URL of some webpage which you want to convert from html to bmp.It can be seen as source file. 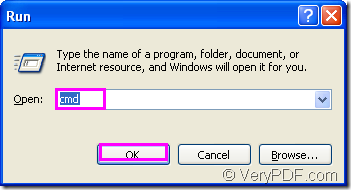 "C:\Documents and Settings\admin\Desktop\New Folder\verypdf.bmp" is the path and name of target file.If you don’t want to define the path for the file,the target file will be saved in current directory—C disk.If you don’t define any information about the target file in command line,the source file will be converted to pdf file by default. Figure5 shows the location of target file. Then the conversion of html to bmp is over.